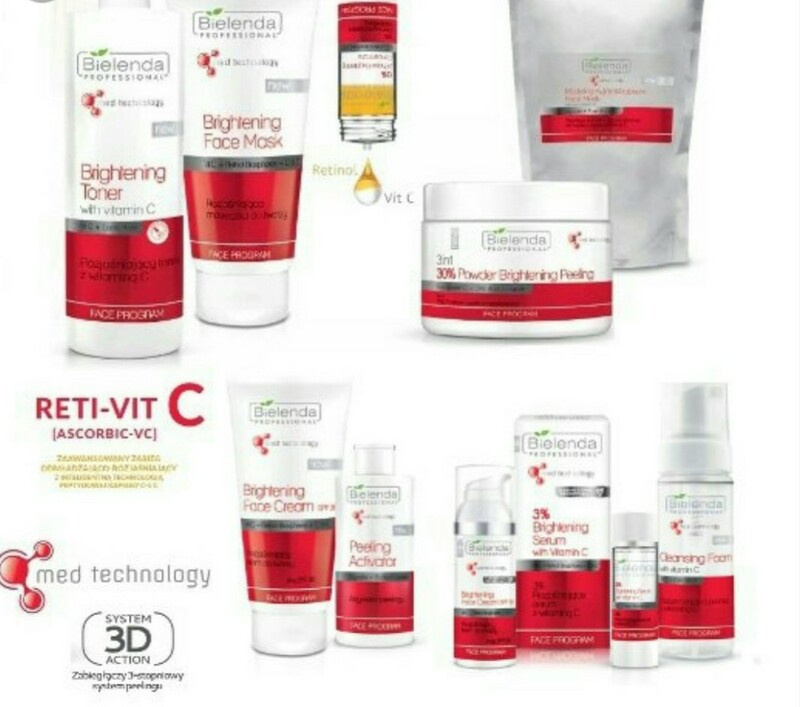 Great treatment for those who are trying to fade the effects of dark spots on face uneven skin tone, repair sun damage and trying to treat the inflammation that occurs with acne. Mandelic acid gently adheres to the skin in order to peel away dead and dying skin cells so that new cell growth is revealed and so that new skin cells growth faster. 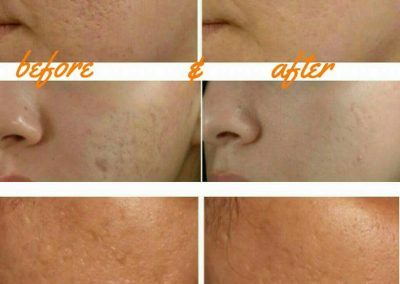 It helps reduce freckles, acne scars, discolorations and small wrinkles. The treatment is painless. 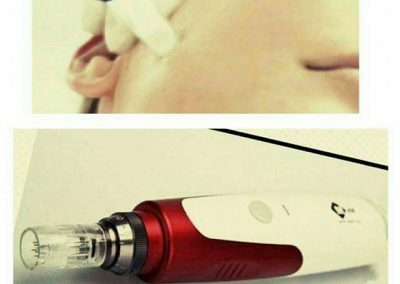 MICRONEEDLE MESOTHERAPY the treatment depends on puncturing your skin with the micro needles and at the same time active substances such as minerals, vitamins hialuronic acid and aminoacids are delivered in to the skin. The cocktails are chosen depending on the needs of the client skin. 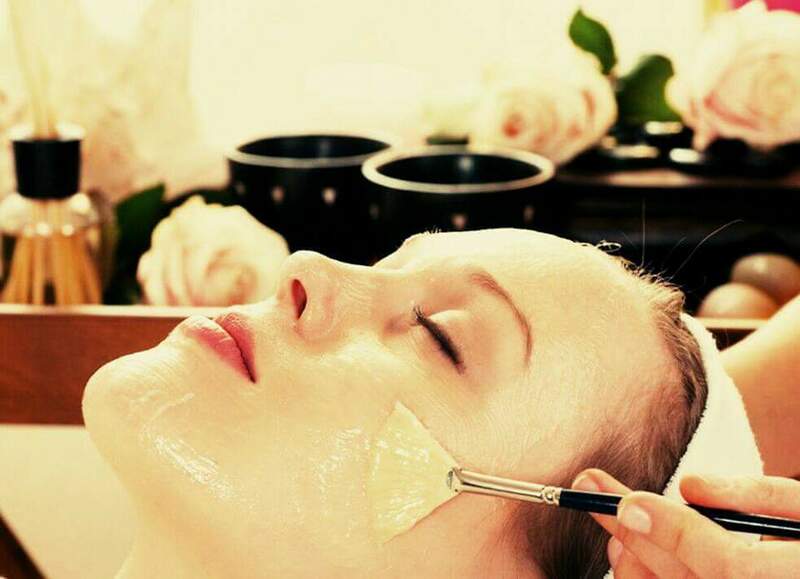 Treatment highly firms and nourishes the skin,it becomes deeply hydrated. It can visibly improve the appearance of fine lines, wrinkles, surgical,acne and trauma scars, stretch marks, pigmentation. 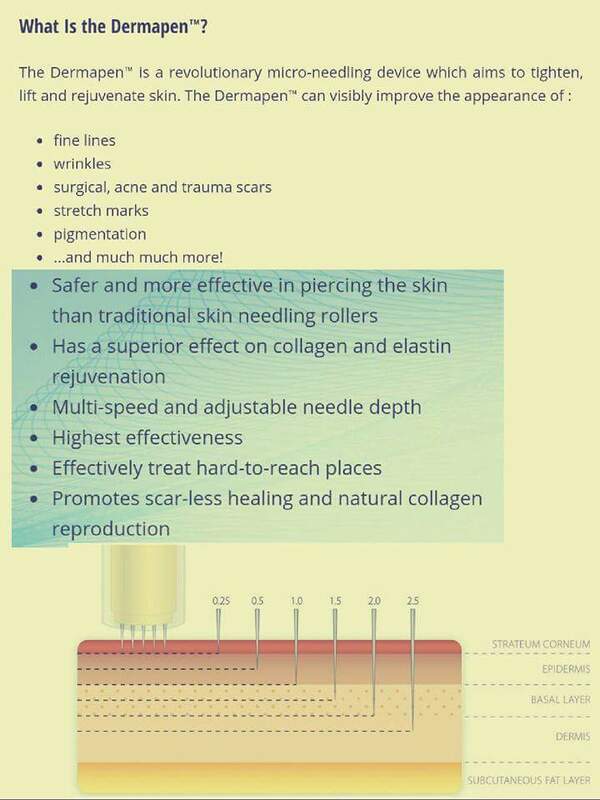 Treatment has a superior effect on collagen and elastin rejuvenation. Promotes scar-less healing and natural collagen reproduction . 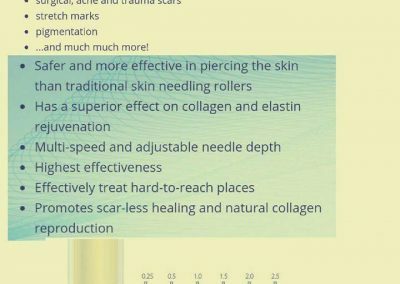 Dermapen is safer and more effective in piercing the skin than traditional skin needling rollers.Multi speed and adjustable needle depth. Highest effectiveness, Effectively treat hard – to –reach places. The treatment smoothens and regenerates the skin ,it improves the firmness and enlights the skin, which is then nourished ,collagen fibres are reestablished. 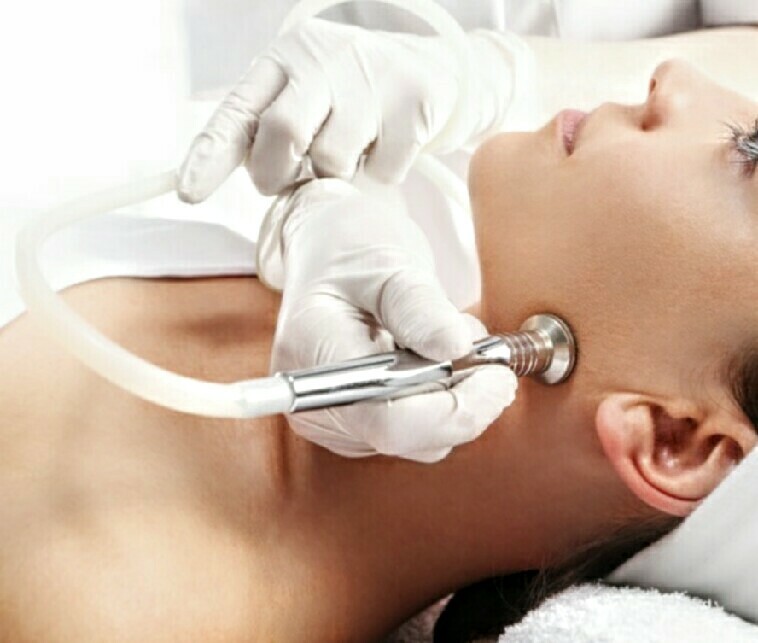 Microdermabrasion removing dead skin cells and allowing new, healthy skin to shine through. 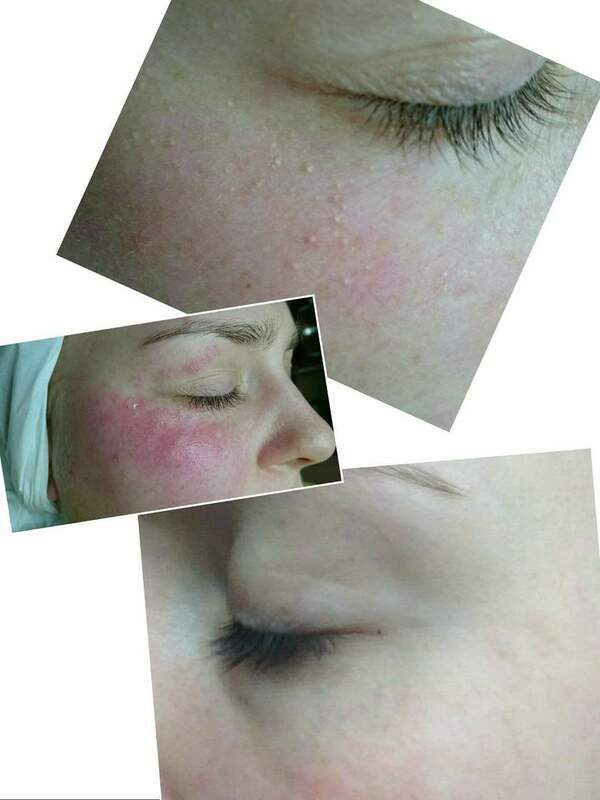 Microdermabrasion treatments are extremely safe and effective. Any redness, temporary flaking and mild discolouration will disappear after your treatment, and can be covered with a light layer of makeup. Including a Professional Cleansing, Exfoliation, Serum, Cream or Algae Masque and Professionally Selected Cream Full of Active Ingredients Which Will Revitalise Your Skin. Including a Professional Cleansing, Exfoliation, Serum, Cream or Algae Masque And Professionally Selected Cream With Active Ingredients To Revitalize Your Skin. 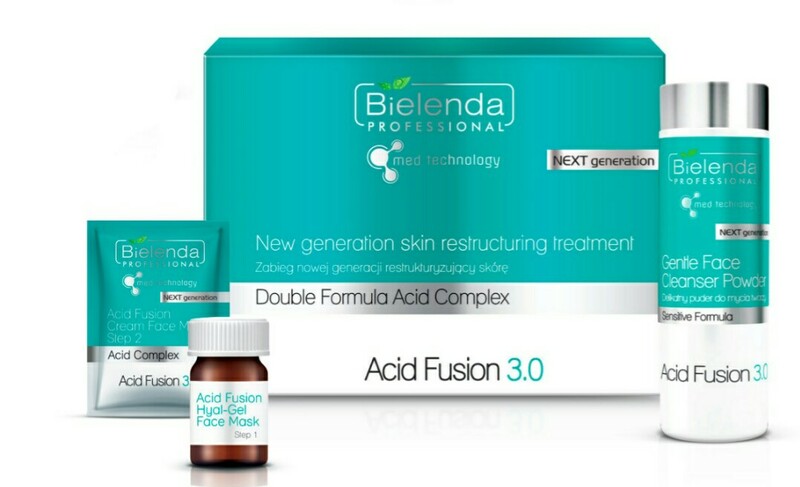 New generation skin restructuring treatment. 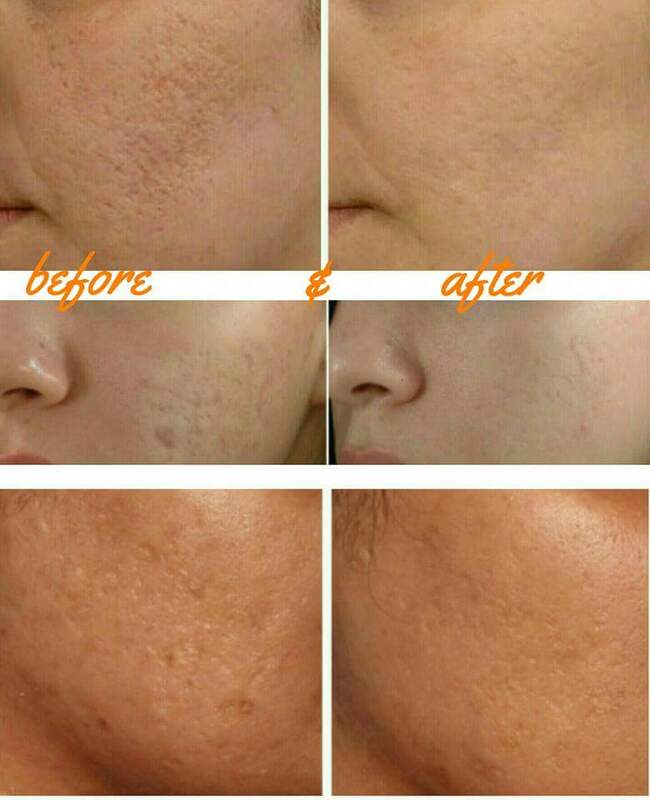 Indication for the treatment: discolorations of various origin, uneven skin tone, small wrinkles, uneven skin texture, excessive sebum secretion, acne. Acid Fusion -reduces discolorations, evens out skin tone, slows down skin aging processes, normalizes sebum secretion, reduces inflammation. Recommendation: Client will leave our salon with the Mask leave-on (time is 7-10 hours) we recommend performing the procedure every 7-10 days. Advantages: Immediate smoothing of the skin, brightening of the skin and reduction of visibility of inflammation, no peeling or flaking of the skin. Energizing and oxygenating treatment. 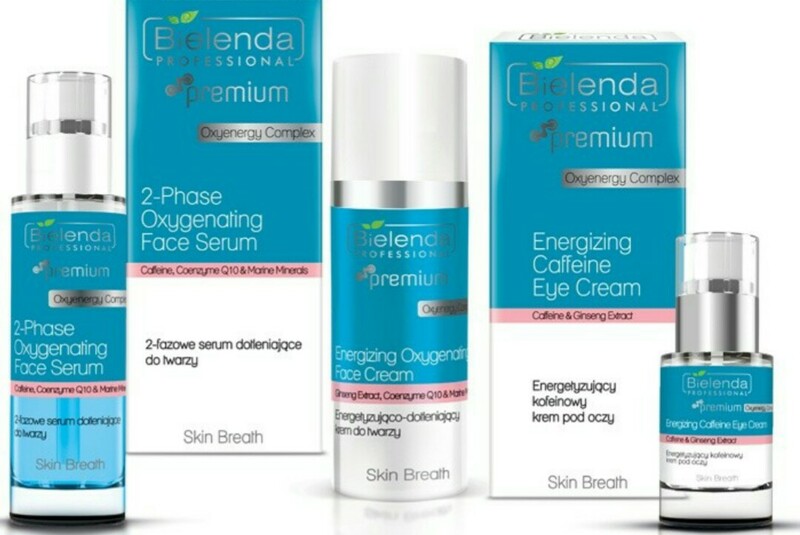 Indications for treatment: Every skin type and especially: dull and anoxic skin, smoker’s skin, ashen skin, wrinkles, lack of skin firmness, dry skin, skin affected with premature ageing and oxidative stress, puffy eyes and dark circles, sensitive skin, excessively tanned skin. 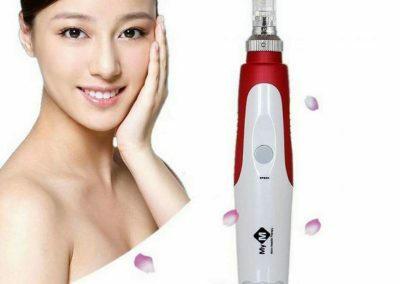 After the treatment you will enjoy Illuminated, brighter and oxygenating skin, skin breath treatment slowing down changes caused by oxidative stress and harmful effect of UV radiation,another benefit is reduction of puffy eyes and dark circles, reduction of wrinkle depth and increased skin firmness. Recommendations: The recommended series is 4-8 treatments once a week, for better skin condition 1 treatment once a month. Advantages: Immediate cleansing and deep moisturization of the skin, fresh, youthful look. Detoxifying and Regenerating treatment the first with magnetic enzymatic scrub. Treatment is perfect for dull, anoxic skin with impurities frequently exposed to deteriorating urban elements. Skin in need of regeneration, after intensive exfoliation and / or aesthetic medicine procedures, also with special equipment. 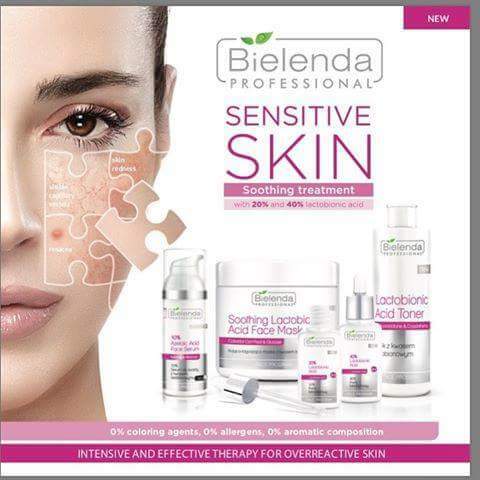 Irritated, ageing skin; skin with acne and / or acne scars . Treatment may be repeated once every two weeks. Benefits : deep hydration, improved texture, strong antioxidising, restoration of skin barrier, regeneration of the skin, detoxication and brightening of the skin. SOOTHING AND ALLEVIATING TREATMENT FOR DELICATE AND SENSITIVE SKIN. Perfect for delicate, sensitive and thin skin prone to irritations, skin with dilated capillaries, prone to discolorations, dry after exfoliating treatments, exposed to adverse external conditions (changeable temperatures, frost, wind, etc. ), irritated after intensive skin tanning, hair removal with wax (upper lip, etc. ), for men (after shaving), tired skin exposed to stress . soothed skin irritations, reduced skin sensitivity, lasting epidermal and deep skin moisturization, intensive strengthening, regeneration and protection, skin protection against adverse external conditions. 6 treatments once per week is initially recommended . Perfect for skin lacking radiance, with signs of fatigue, exposed to oxidative stress; evening out of skin tone, lightening discolorations; skin in need of rejuvenation and illumination. Treatments can be performed throughout the year, provided high UV protection (min. SPF 30) is used. Avoid excessive exposure to the sun in the course of a series of treatments. Treatment may be performed on the face, neck or hands. The proposed series includes 6-8 treatments performed every 7-10 days. 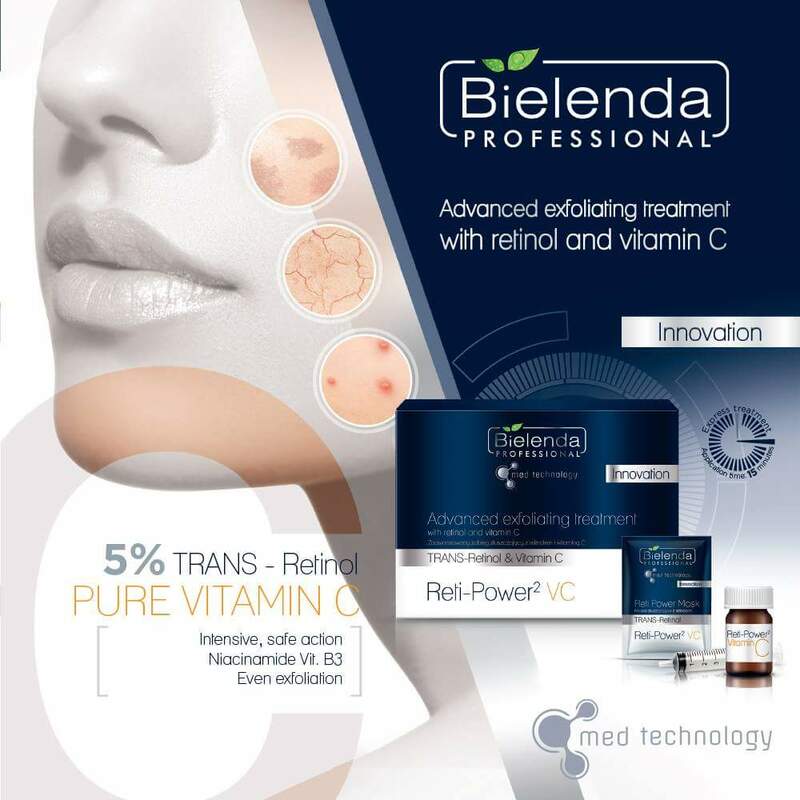 One treatment per month to sustain the effects; as one-time treatment to quickly improve skin’s condition. The client should not wash the skin for at least 6 hours following the treatment in order to maintain continuity of the procedure. These are tiny hard white lumps containing keratin which lie just under the surface of the skin. This occurs when dead skin cells and sebaceous matter gets trapped near the skin surface rather than exfoliate naturally .